There’s more than one intimidating beast amongst men when it comes to Mani Photography’s superb, digitally manipulated photo series ‘The Giants’. Lions, tigers, leopards, snakes, and wolves are often perceived as fierce predators, but what if they were portrayed in calmer light? “The thought of animals being bigger than humans and them still being calm and harmless to humans inspired me to make this series,” explains Mani inside an email to DesignTAXI. Aside from these powerful hunters, Mani has also included the more familiar, domesticated neighbors such as dogs, cats and fish. The Toronto-based Photoshop artist explained that sourcing for ideal images can be a time-consuming process. On average, it takes about one to two hours for him to create one graphic, sometimes more. Look out for Mani’s upcoming works and in the meantime, enjoy highlights from ‘The Giants’ below. More of the photographer’s creations can be viewed on his Instagram @maniphotography91 and Facebook. 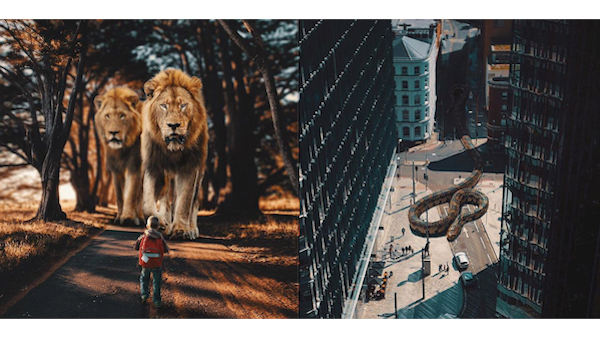 In another eye-catching digitally manipulated series, a graphic design enthusiast photoshops surreal images of animals in fantasy worlds.